Evaluating, implementing and managing an elearning program is a big task. As a result, you and your learning department may have put off implementing such a program simply because you aren’t sure where to start. You understand the value of elearning and are anxious to integrate it into your current learning initiatives, you just need a little help getting from point A to point B. The first ebook in our series, 5 eLearning Myths busts some of the common misconceptions around elearning and provides learning leaders with the arguments and tools necessary to achieve buy-in from decision makers. The Game Plan ebook lays out step-by-step what you need to implement an elearning program, including: knowing the lingo, evaluating course formats, choosing a payment model, tracking participation and measuring effectiveness. Unlike competency maps, which only connect one course to one skill, a training track addresses the spectrum of competency levels possessed by most employees. The goal of On the Right Track is to help you create a comprehensive program to address some of the more complex skill sets necessary for your company to succeed and develop its employees. Bonus Leadership/Management Sample track included! Trump the Usage Slump covers everything from creating objectives, to branding your initiative, to keeping employees engaged once you’ve launched. And while the ebook focuses on kicking off a new program, many of the tips and exercises are just as relevant for companies that have already begun their elearning programs. If you are looking to start a new learning program, use the eLearning Sucess Toolkit as a step-by-step guide to designing and implementing your initiative. For those that already have a program in place, this toolkit can serve as a series of exercises by which to evaluate and improve your current initiative. 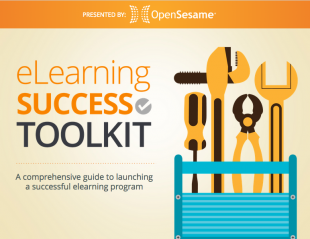 Get the most from your elearning program in 2015 with this complete toolkit—download your free copy today!